Pundits and pollsters declared Republican Mike Pence the winner of Tuesday's vice presidential debate, but that doesn't mean that like his running mate, Donald J. Trump, Pence didn't manage to offend many African Americans, Hispanics and Asian Americans. The debate, the first to be moderated by an Asian American, Elaine Quijano of CBS News, a Filipina-American, drew 37.16 million total viewers across nine networks, the smallest for a vice presidential debate since 2000, according to early Nielsen data, but bigger than the audience for this year's Academy Awards. In post-debate commentary, the Indiana governor was declared the winner on style rather than substance. Commentators conceded that Sen. Tim Kaine, D-Va., didn't tell the whoppers that Pence did, but the Democrat lost points by interrupting the governor 70 times, according to a count by Ryan Struyk of ABC News. The 90-minute debate was wide-ranging, with Quijano announcing at the outset that she intended to cover domestic and foreign policy issues in nine different segments of 10 minutes each. She was criticized by some pundits for losing control at times or for being too eager to get through her list of questions rather than let the candidates play out their arguments. Others, however, praised Quijano's judgment and ability to "keep it moving." Responses that particularly pushed buttons of some African Americans, Latinos and Asian Americans concerned police-involved shootings, a Pence comment about "that Mexican thing" and the Indiana governor's efforts to combat terrorism through the immigration system. Pence pointed to an endorsement of Trump by "the 330,000 members of the Fraternal Order of Police" because, Pence said, "they see his commitment to law and order. But they also — they also hear the bad mouthing, the bad mouthing that comes from people that seize upon tragedy in the wake of police action shootings as a reason to use a broad brush to accuse law enforcement of implicit bias or institutional racism and that really has got to stop. . . ."
Kaine replied, "I guess I can't believe you are defending the position that there is no bias . . ."
Pence countered, "I did not make that statement" but went on to praise "stop and frisk" programs that a federal judge ruled in 2013 were carried out in a manner that violated the U.S. Constitution. While touting the FOP endorsement, Pence did not say that black and Latino members denounced the national union's action. “Our Local is saying that they have to follow the lead,” Rochelle Bilal, head of the Philadelphia Guardian Civic League, told the Philadelphia Tribune last month. “We are saying that you don’t — that when you know that you got Black, brown and other members of this organization, if you don’t care about supporting an outrageous bigot, then you need to find a way to give us our money back from our membership." Meanwhile, Latino scholars and activists criticized Pence for referring to 'that Mexican thing' as he tried to brush aside criticism of Trump's comments about Mexican immigrants, Russell Contreras and Amy Taxin reported Wednesday for the Associated Press. "They said Pence's remark was dehumanizing and tinged with sexual innuendo. "Pence's comment came after Democratic vice presidential Tim Kaine pressed the Republican on Trump's remarks last year comparing Mexican immigrants to rapists.
" 'Senator, you whipped out that Mexican thing again,' Pence said. "By Wednesday, #ThatMexicanThing was trending on Twitter as Latinos widely made fun of the remark with memes, gifs, and satirical versions of Trump's 'Make America Great Again' red cap. . . ."
The reporters quoted Rep. Xavier Becerra, D-Calif.: "As the son of immigrants, I've lived with the 'Mexican thing' all my life. "I never would have believed that into my 50s I would witness a candidate for president and vice president mainstreaming the same hurtful rhetoric." Pence's "Mexican thing" comment came in reaction to Kaine quoting Trump saying Mexicans are rapists and criminals. "Can you defend it?" Kaine asked. Pence replied, "There are criminal aliens in this country, Tim, who have come into this country who are perpetrating violence and taking American lives. And he [Trump] also said: 'and many of them are good people.' You keep leaving that out of your quote. . . ."
"The Trump campaign has always based its campaign on the falsity of a chaotic border and invading Mexicans, and by setting up that fear, he then connected it to terrorism and crime: 'It’s coming from more than Mexico. It’s coming from all over South and Latin America, and it’s coming probably — probably — from the Middle East.' This has been the Trump Doctrine for everything else in his presidential run, and Pence will want us to believe that the whipping out of 'that Mexican thing' is a non-issue. . . .
"What Trump said last June was based on racism, xenophobia and unfounded fear. 'That Mexican thing' that Pence shrugged off last night will very likely be the end of a Trump-Pence 2016 ticket just like 'self-deportation' was for Mitt Romney in 2012. The Republican Party just doesn’t get it and it looks like it never will." Immigration was linked with terrorism in another portion of the debate. Pence defended his decision to block aid to Syrian refugees resettling in Indiana, an action an appellate court ruled Monday was discrimination on the basis of nationality. 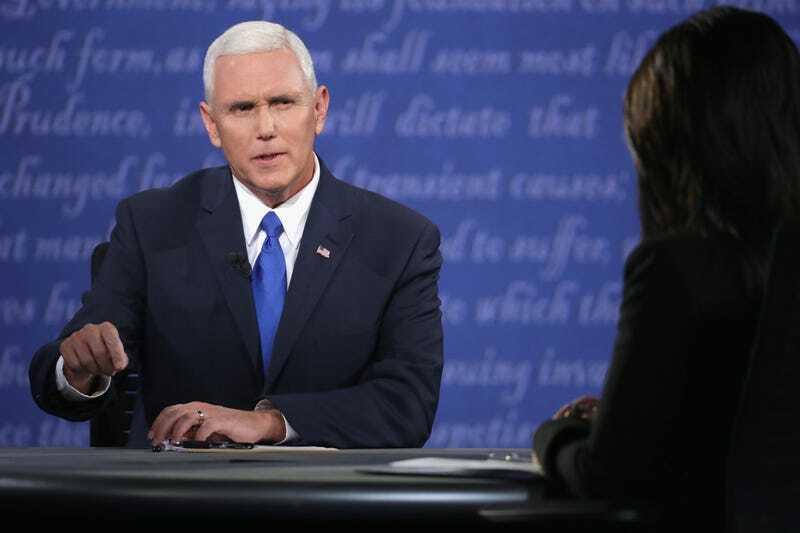 Pence protested in the debate that his action was justified; "The FBI and homeland security said we can't know for certain. You've got to err on the safety and security of the American people, Senator." Inevitably, some topics were left out of the debate. "Neither moderator Elaine Quijano nor Kaine brought up Pence's support for Indiana's Religious Freedom Restoration Act, which originally allowed discrimination against LGBT people on so-called religious grounds," Raul Reyes observed on NBC News Latino. "LGBT rights is an issue that resonates with Latinos; a Public Religion Research Institute poll found that three-quarters of Hispanics support laws that protect LGBT people from discrimination. So here Kaine missed a shot at drawing another distinction between the two tickets. . . ."
Still, David Leonhardt, a columnist at the New York Times, found it noteworthy that concessions were made at all to people of color. That indicates how the nation is changing, he said. "I was really struck during this debate about how much, how much times have changed in this country," (audio) Leonhardt said Wednesday on "The Diane Rehm Show," which airs on NPR via WAMU-FM in Washington. "The fact that Kaine said, look, we need to be able to talk about unconscious bias, I don't think we'd hear that in the 1980s in this country. And it was a reminder to me of how much less white the United States is than it used to be, and how that allows and even forces more honest, more productive conversations about race. "Because when we were a country that was 80 percent white, politicians really had to play overwhelmingly to white people. And now they need to play to a much more diverse country, and deal with many more of the subtleties connected in this, and I thought it was fascinating." Clarence Page, Chicago Tribune: Does Donald Trump help himself by bringing up Monicagate? "Republican presidential nominee Donald Trump appears likely to garner fewer endorsements from newspaper editorial boards than any other major party nominee in modern history," Reid Wilson reported Wednesday for the Hill. "Among the nation’s 100 largest newspapers by paid circulation, not a single editorial board has sided with Trump. "Even Libertarian Party nominee Gary Johnson has earned more support, a new tally shows. "Through Monday, 20 of the nation’s largest newspapers had formally endorsed a candidate for president. Seventeen have backed Hillary Clinton, the Democratic nominee. Three support Johnson. And USA Today editorial writers, in a break with more than three decades of precedent, weighed in specifically against Trump. . . ."
Jim Rutenberg, New York Times: The Editorialists Have Spoken; Will Voters Listen? "Our ongoing investigation into the ongoing human rights catastrophe that is our local jail system unleashed a blockbuster scoop today, video of guards body slamming, pepper spraying and piling on top of an inmate who said 19 times that he couldn't breathe," Ryan Grim, Washington editor of the Huffington Post, wrote in an email to media writers Wednesday. "He was dead by the morning, but nobody is being prosecuted. . . ." The story, filed from Bowie County, Texas, by Ryan J. Reilly, is headlined, " 'I Can’t Breathe’: Disturbing Video Shows Father Of Four Begging Guards For Help Before He Died In Jail: Michael Sabbie, 35, died of 'natural' causes after being pepper-sprayed and repeatedly asking employees at a privately run jail for help." "Fox News and The O’Reilly Factor correspondent Jesse Watters [have] responded to claims that a segment he filmed in New York City’s Chinatown was racist by saying the clip was meant to be 'tongue-in-cheek.' ” Cady Lang reported Wednesday for Time. " 'My man-on-the-street interviews are meant to be taken as tongue-in-cheek and I regret if anyone found offense,' Watters said in a message on Twitter Wednesday. . . ." The Asian American Journalists Association was among those objecting to the segment and demanding an apology. AAJA asked, "What type of diversity and sensitivity training is being undertaken in the newsroom to broaden the understanding of the diverse audience of 2016?" "With the Howard University School Of Communications celebrating its 45th anniversary last month and speculations of a new School of Communications’ building to be built in the near future, the school will now be having a new name: the Cathy Hughes School of Communications," Paul Holston, editor-in-chief of the Hilltop, the student newspaper, reported Wednesday. "According to Radio One’s WOL News Talk 1450 AM, the naming ceremony will be held on Sunday, October 23, at Howard University, a day after the conclusion of events from Howard Homecoming’s #ExperienceBlueprint. . . ." Hughes' son, Alfred C. Liggins III, president and CEO of Radio One, Inc., said in July that the company recently fulfilled a $4 million pledge it made two years ago to the School of Communications.
" 'Today our one meal was rice and bean soup. Our bodies are no longer used to eating,' ” George Gene Gustines wrote Monday for the New York Times. "That is the opening of 'Madaya Mom,' a true-life comic book being released on Monday by ABC News and Marvel Comics. The comic, which will be free to download, offers an inside look at a woman living in Madaya, Syria, under the harsh conditions brought about by the conflict in the region. . . ."
"There are communities around this country that have schools that are more segregated today than they were 10 years or 20 years ago," Education Secretary John B. King Jr. said in January. "I know this, in part, because I was in a desegregation program as a kid: a school busing program in Boston that is still going today," co-host Audie Cornish told listeners of NPR's "All Things Considered" Wednesday. ". . . . I wanted to see how things have changed, so I went back to my old neighborhood in Boston. . . ."
"Shimon Peres has died," the Arab American News, based in Dearborn, Mich., editorialized Sept. 29. "The butcher of Qana, who introduced nuclear weapons to the Middle East, is being bewilderingly hailed as a man of peace by U.S. media and politicians. Peres was a nationalistic war criminal, whose atrocities against the Palestinian people predate the state of Israel. Peres immigrated with his family to Palestine from a Polish town in what is now Belarus in 1932. As a teenager, he joined Zionist gangs who terrorized Palestinians, causing the exodus known as Nakba. . . ."
"According to a recent report from two progressive think tanks, CFED and the Institute for Policy Studies, white households own, on average, seven times as much wealth as African-American households (and six times as much as Latino ones)," James Surowiecki reported for the Oct. 10 issue of the New Yorker. "The Forbes 100 billionaires are collectively as rich as all black Americans combined. At current growth rates, it would take black Americans two hundred and twenty-eight years to have as much wealth as white Americans have today. . . ."
"Civil rights attorney Steve Phillips, author of the book 'Brown is the New White,' told some of the nation’s top thought leaders and corporate executives committed to diversity and inclusion that a 'New American Majority' is 'transforming all manners of modern society.' . . .” Phillips, speaking at DiversityInc's fall conference Wednesday in Newark, N.J., said that in the workplace highly talented people of color are often “hiding in plain sight,” Sheryl Estrada reported for DiversityInc. "In a partnership between the London College of Communication and the Migrants Resource Centre, we developed The Refugee Journalism Project," Vivienne Francis wrote from Britain Aug. 27. "Through mentoring, journalism workshops and internships, we seek to support refugee and exiled journalists to build up their network of industry contacts; update their skills; and help get their voices into the mainstream media. . . ." Catalina Albeanu posted a podcast about the project on Wednesday.